If have an idea and nobody listens then it is just an idea. 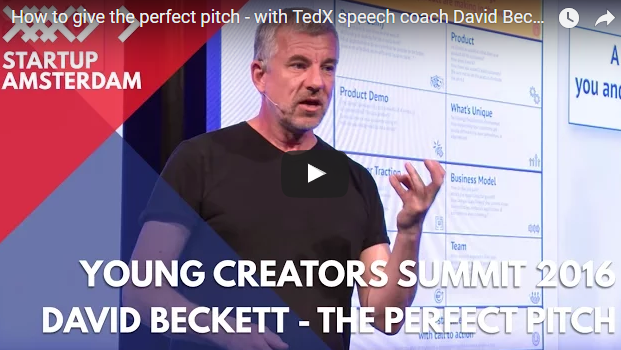 If you have an idea for a Startup “…if you can’t pitch you can’t survive…” David Beckett pitch trainer and TEDx speech coach reveals four principles at the 2016 Young Creators Summit that will definitely help the entrepreneur more than just survive. If you didn’t have 30 minutes – watch the last 17 minutes of his presentation. It will forever change how you look at giving a business pitch. I have downloaded David’s free entrepreneurial brainstorming tool “The Pitch Canvas”. This one page will help you to structure and visualize your winning pitch.